It’s not very obvious what the magic number 5000 means? Does it mean 5000 years? 5000 minutes? 5000 the time it takes to run around Main Market Square in Kraków? and see that the number denotes milliseconds, but then you (as well as the junior programmer who will maintain the codebase) have to remember what a millisecond is, and what it means to wait 5000 milliseconds. What this means, is not that junior developer is not very bright – no. Quite the contrary – he would be doing the right thing, only the wrong way. He would be increasing the readability of the code by documenting it. However, he would not have to do that, if the code was self documenting. Mommy, there be dragons in my code. …until today, and I’m shocked. In a mostly positive way. There are few good ideas there, that I would like to discuss. I really like the idea of being able to mark some parts of code as TODO and have it blown into your face in a controlled fashion when you forget about it. Too many times a forgotten quick and dirty hack slips under the radar and get left behind, forgotten waiting to blow up in production or during very important presentation. Another, very neat idea I found in the library is the ThereBeDragonsAttribute class. This marker attribute decorate dangerous parts of the code where for some reason the developer decided to do something in a way that is not straight-forward. This usually means that this is using some functionality that is not fully supported. Using wacky, unsupported or hackish code is something everyone does occasionally. I usually comment this piece of code, be it a method or a class, but comments are often not enough. With little help of NDepend to bring these pieces of code to everyone’s attention this may be a very useful warning sign for everyone on the team to handle this code with special care. 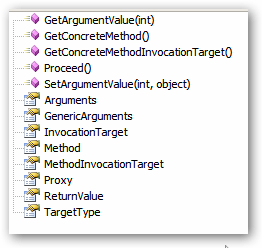 There are many other useful classes in Rhino Commons, but most of them are pretty standard stuff (maybe with the exception of property indexers). What other non-standard, helpful little (or not so little) classes do you use in your code? I’ve been experimenting lately quite a lot with Castle Dynamic Proxy, creating prototype for a project I work on at work and I even implemented a small feature that was missing from it. Generally, Dynamic Proxy (DP from now on) is a great, lightweight framework, but it’s greatest downside is lack of documentation. It’s surprisingly logical a easy to use, but since there are almost no resources on the web, that could help you get started with it, I decided to give it a go, and start a small tutorial series of posts, that will introduce various features of DP while working on a simple sample project. The project is to add ability to freeze objects, so that from the point in time where object has been frozen, it’s state can not change. AFAIK there’s such feature in WPF, but since my knowledge of WPF is very limited, I don’t know how that works. The project itself is not important (nor the usefulness of its implementation). It’s only purpose is to serve as didactical example. 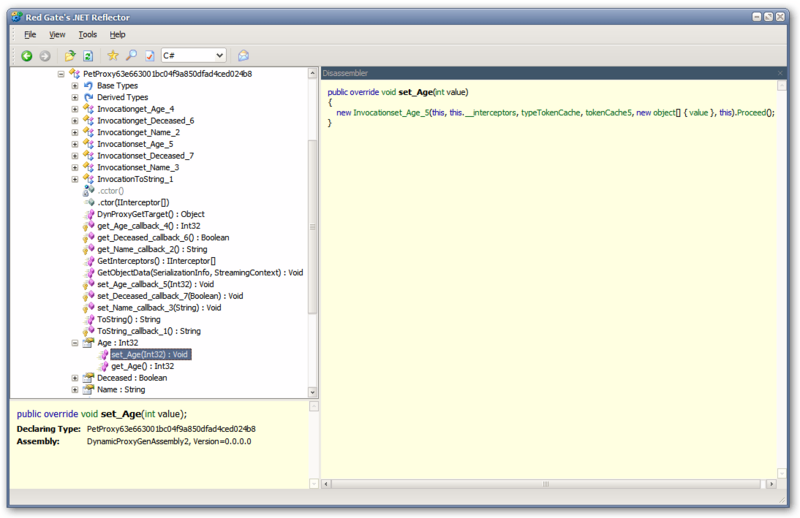 I am also aware that the state of the project shown here is far from how good code should look like. We will evolve the implementation in forthcoming parts of the tutorial, as we introduce other concepts and features of DP. How do we do that? Well, DP creates a transparent proxy for the real objet at runtime for as, and we can intercept the calls to it, and add logic to the objects. This is a very powerful capability and possibilities of using it, are virtually endless. We use static class Freezable to create freezable objects, and to query their state. This allows us to have really simple API (and implementation), and encapsulate all (well, not all – yet) freezable logic in one place. This implementation has one shortcoming that you may have spotted – the class we want to make freezable instance of, has to have default, parameterless constructor. This is not a DP limitation however, and further along the way, we will remove it. Ok, so how do we go about implementing the whole thing? It will help us by providing all the information we need. Still however, no word about DP, and we have implementation of MakeFreezable missing. Also, a reader may point out, that by virtue of keeping some mapping from objects to interface, objects won’t magically gain behavior. That is true, with a little bit of work however, they will. What we need to do, is to monitor calls to property setters, and if object is indeed frozen calling a setter should raise an exception, as shown in the test. To do that we need to actually intercept the call, and for that, we have IInterceptor interface. The IInvocation is another interface that holds all the information about the call. Our interceptor holds the freezability state of the object. Since we create one interceptor per object, it will work. In the Intercept method, interceptor checks if the object is frozen, and if called method’s name starts with “set_”, as is the case for all property setters. 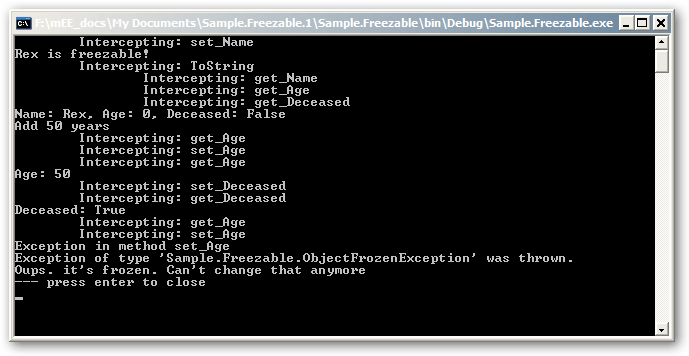 If indeed that’s the case, it means that we’re trying to set a property of a frozen object, so a ObjectFrozenException is thrown. Otherwise, we can proceed with the call. 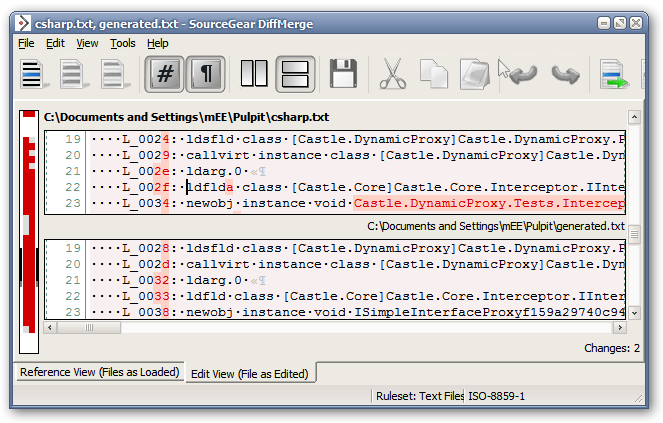 ProxyGenerator class is the heart of the DP library. It has numerous methods for creating different kinds of proxies, but for now, we will only use one: CreateClassProxy, that creates a proxy for a class. We create a FreezableInterceptor to intercept the calls, verify freezability state of the connected object, and throw if necessary, then we create the actual proxy, add it along with its freezableInterceptor to the dictionary, and return. In call to CreateClassProxy generic method we pass one more argument – a new instance of CallLoggingInterceptor. It’s a simple class that also implements IInterceptor interface that logs all the intercepted calls to the console. This also means that you can have more than one interceptor for a proxy which is a very powerful and handy capability. With that, we basically have out initial implementation complete, we only need to create missing exception classes and we are good to go. Indeed, all the tests should pass now. We created IInterceptor implementation, that overrides Intercept method and keeps track of freezable state of an object. We created really simple logic to correlate out freezable objects with interceptors, that keep their state. And with all of that we barely scratched the surface of what can be done with DynamicProxy. If the last screenshot left you with headache don’t worry, by the end of this tutorial it will be all crystal clear. See you in part II, where we will introduce IProxyGenerationHook, to give us more fine-grained control over our interceptors. If you have any questions or suggestions please, leave a comment. The solution with tests is available here. DynamicProxy I use is the trunk version. You can get the latest version here. 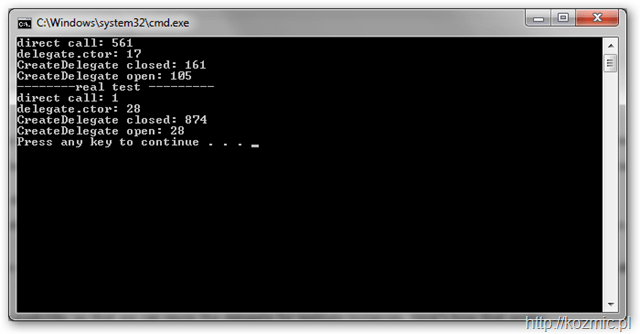 To run tests, you will also need xUnit framework, available here. Patrick Smacchia wrote a post where he compares execution time while using different patterns to iterate over a collection, namely List<int> and int. Since he provided the code, I decided to give it a go as well. Only thing I did, was I added [MethodImpl(MethodImplOptions.NoInlining)] for each method, since they all were very simple, and could easily be inlined. When you turn off inlining results are much different. First, foreach is as efficient on arrays as on lists (which is different than Patrick’s results. My guess is, that since CLR has more intimate knowledge of arrays, it somehow optimized it when inlining was turned on). iterating with for loop is faster when you do the trick Patrick called “count optimization”. This is quite the contrary to what Eric Gunnerson said, and I’m puzzled about it. You don’t get the C# 4.0, do you? Sorry for the daring topic, but that’s really what comes to my mind when I read or hear people whining about C# loosing purity/object-orientation/strongly-typedness/goal/insert your favorite here, with the advent of version 4.0. To sum it up, there are four major new areas of improvement coming up with the forthcoming version of the language, as outlined by Charlie Calvert in “New Features in C# 4.0”. dynamic keyword (type) along with all its implications. I don’t really care about COM, and covariance and contravariance is not really controversial (at most people will grumble that they have to learn how to use it properly), so I’m going to leave those two out, and concentrate on the first two features. What is really the chance that you’ll get all the parameters right each time you call them, not mixing the order, and passing localName instead of prefix, or the other way around? Think about how utterly hard to read the code is, especially if you don’t have well named variables you pass as parameters. This can be fixed by explicitly passing each parameter along with its name. And it’s not the case only for methods that take that many parameters. One common mistake I see is in constructors of ArgumentException and ArgumentOutOfRange exception, both of which take parameterName and message as a value, but in different order. The feature that gets the most bad publicity is the dynamic programming capabilities introduces thanks to dynamic keyword. That’s what makes people lament, that they will no longer be able to rely on IntelliSense and the compiler, and that this is the advent of apocalypse. Simplified programming model for things you had to rely on strings (ergo, no compiler checking anyway) in the past, so no harm done here. Improved performance as compared to what you could achieve with reflection thanks to smarter runtime resolution. Less ugly code in those places, thanks to not having to use reflection or any other crazy mechanism to circumvent inability of making dynamic calls. I hear that you say that this may be abused in the multitude of ways. Well – yes, no compiler or language let’s you stop thinking (and if there were such compilers or languages, we’d be out of job!). That is the case with everything though. C# has support for pointers, you know? It was added to deal with certain narrow range of scenarios, and it was there since v1.0 but I don’t see it used all over the place by anyone. Heck, there are features in the language many experienced developers didn’t even heard about, left alone used them. Example? – stackalloc keyword. Did you know about it? Have you seen actually code that uses it? I haven’t. You can cut yourself with just about anything. We want more power in the language, but with power comes responsibility. The dynamic keyword hugely helps in certain scenarios, and if used wisely can do you nothing but good. It looks like I will have to wait till tomorrow to play with partial local types, dynamic objects, and whatever Anders is announcing right in this very moment. Those two methods are by no means comparable in regard of what they’re doing. They are mere examples of simple tasks: one involving Reflection, and one involving StackTrace. The fact that the difference in performance is nearly two orders of magnitude, should make you think twice before you go down the StackTrace path. Especially considering the fact, that you can’t really cache it.